Farming Frostweave is surprisingly profitable compared to farming Netherweave. This is because Frostweave is much more valuable on the auction house, anywhere from 1.5 gold to 5 gold depending on your realm per cloth. That’s 30 to 100 gold per stack! Tailors still use this stuff to make gear, usually to disenchant and sell the resulting enchanting materials. You might want to do this too if you’re an enchanter. Frostweave can be found all over Northrend, but its drop rate is horrible. If you’re not a Tailor with Northern Cloth Scavenging then you should skip farming Frostweave all together. Really. 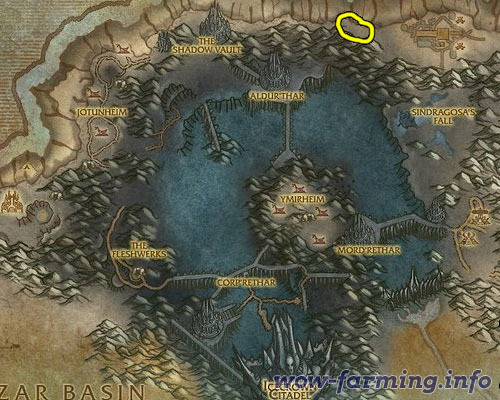 If you still insist on farming Frostweave yourself, just follow this guide but keep in mind you will find a lot less Frostweave than your competition. If you have tailoring leveling 325 but don’t have Northern Cloth Scavenging, visit a Tailor trainer in Northrend to receive this skill. It will effectively triple the amount of cloth you find. Update: You can make a lot of gold with Frostweave, but if you want to step it up and make thousands of gold you should read my personal favorite guide. The best place to farm Frostweave is in Icecrown. There aren’t a lot of places to farm it like there are for Netherweave, but you’ll be able to sell the Frostweave for a lot more gold. If you’re level 85 or a vey well geared level 80 you can slaughter packs of Converted Heroes. They come in packs of 4-6 and will destroy you if you’re not prepared. On the bright side they will drop nearly a stack of cloth (worth up to 150 gold) per group. As an 85 you can clear out all the packs so fast you will be waiting for them to respawn. If you’re level 79 and can get to the northern part of Icecrown (with Northrend Flying) you can kill Dark Ritualists and Dark Zealots in privacy. This is the next best place to farm Frostweave. If you don’t have Northrend Flying there really isn’t a good place to farm Frostweave but you can find groups of humanoids to farm and have moderate success.